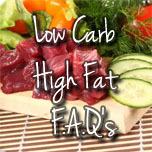 As we did when we first started (and still do), i'm sure you have many questions about the Low Carb High Fat food lifestyle. We have provided this Frequently Asked Questions page to try and help out with common queries and answers from our own and other peoples experiences. If you have a question that you didn't find in our F.A.Q, you can ask it here and we will try and answer it as best we can. Not only that, your question can go onto the site to help others who might be thinking the same thing. Please Note : Your Name and Email Address will NOT ever be placed on our site. We ask for it so we can email you the response to your question.